Genomic selection in animal breeding means that genomic information is used together with phenotypic information to calculate estimated breeding values. Genomic information in itself is rather useless. It only shows what genetic markers, QTLs, SNPs or microsatellites one animal has. Only by connecting those markers to wanted traits can we select the animal with the "right" markers. For example, we may know that a marker X1 is connected with high milk yield, and X2 with susceptibility to metabolic illnesses. Then we can choose animals with X1 but not X2. Genetic mapping is the key to connect genetic information with phenotypic observations. However, once the traits have been linked with genetic markers, pure genotype information is enough to value an animal. In practice, genomic estimated breeding value GEBV always combines genotypic data with pedigree information. Using genomic information increases accuracy in all traits. Single nucleotide polymorphisms, SNPs, are used in genomic selection. At one time, current genotyping technology can identify up to 800 000 SNPs from a given DNA sample. Those SNPs are evenly distributed to the DNA strand. SNPs are known to be connected to productive traits. Animals are genotyped, their genes are valued based on the SNPs, and then best animals are selected for breeding. We don't need to know where or what the actual wanted genes are - we just know which SNPs are connected to them, and use those as a basis for selection. It's a bit like orienteering: you see from the map where you are and where you have to go, even if you have no clue in which city or country you're in! Illumina is a manufacturer of bead chips, chips which are used to identify SNPs from a genome. For example, the PorcineSNP60 chip has 65000 evenly spaced probes for recognizing SNPs. It can be used for four pig breeds: Duroc, Landrace, Pietran, and Large White. More information about the chip can be found from the product information sheet. Simulations work with four basic forces of evolution: mutation, recombination, selection and genetic drift. Mutation adds diversity, recombination creates new combinations of alleles and breaks linkage between chromosomal regions, selection favours some genotypes with selective advantage and genetic drift makes allele frequencies fluctuate over generations. The key for simulations is that the researcher can change the underlying variables, and study the impact of (for example) population size or family structures to genetic evolution. For a free simulation software, you can try QMsim by Sargolzaei and Schenkel (http://www.aps.uoguelph.ca/~msargol/qmsim). 4Neμ is an important term in simulations. According to professor Alban Bouquet, in a mutation drift equilibrium the SNP (or allele) frequency depends on the variable 4Neμ. If 4Neμ < 1, the distribution is U-shaped. Large % of markers are fixed, and diversity is low. When 4Neμ = 1, the distribution is uniform, and when it's > 1, the distribution is curved out: only a few markers are fixed, and there's high diversity. In most mammals 4Neμ is about 0,001, so most loci are fixed at MDE and many markers need to be simulated. The study by Bouquet and Juga (2012) showed that with JS, using a multiple-ovulation embryo transfer (MOET) herd of 75 heifers genetic gain is significantly increased. MOET does not significantly increase inbreeding rates if over 33 AI sires used. 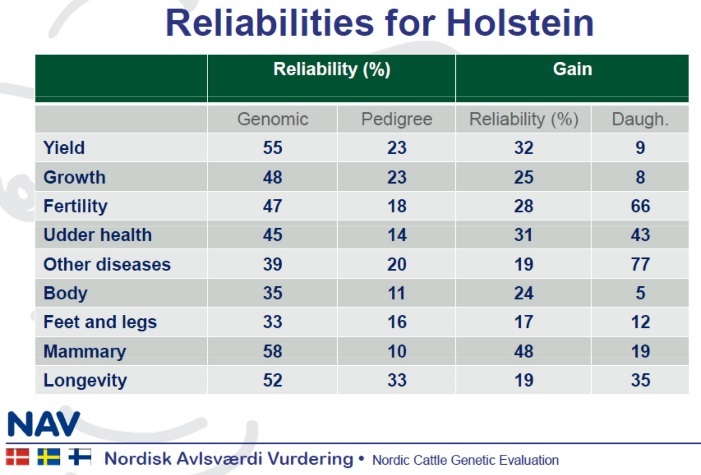 Doubling the number of flushed heifers may change response to selection with over 50 AI sires, but only if the number of genotyped females is increased as well. 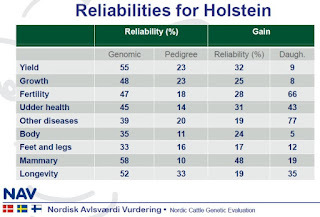 Increasing the number of flushings per heifer from 2 to three increases both genetic and rate of inbreeding, and may not thus be advisable. All in all, MOET and JS combined impact production traits very strongly, but functional traits only little. Compared to traditional pedigree-based selection, the variance of response is slightly increased in JS schemes whereas genetic gain istremendously increased. For pigs genome information also increases the accuracy of breeding values. In a study by Tribout, Larzul and Phocas (2012) a simulation generated 39% - 58% more accurate EBVs with genomic breeding schemes. Annual genetic gain increased 63% - 128%. There was variation in the results between different traits. Rate of inbreeding was reduced 49% - 60%. They conclude that genomic breeding schemes can increase accuracy and genetic gain while decreasing rate of inbreeding without a need to modify current breeding scheme structures.